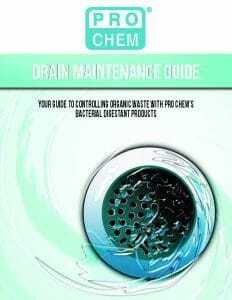 Drain Coat | Pro Chem, Inc. 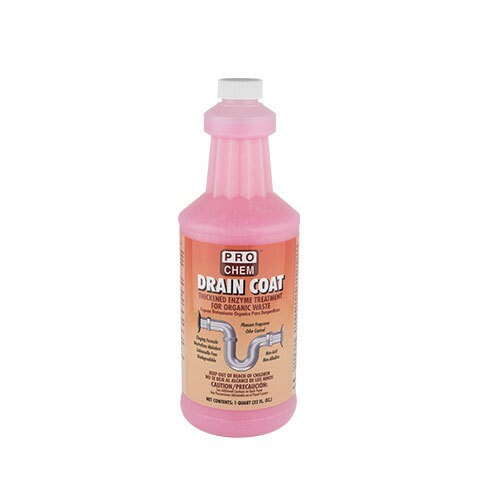 DRAIN COAT’S unique, thick formula grips to the sides of pipes and drain lines, increasing contact for a deeper, more effective solution. It digests and liquefies organic waste, grease and food by-products in hospitals, nursing homes, schools, prisons, funeral homes, apartments, kennels, clinics, porta-toilets, marinas and septic tanks. It contains 300 billion organisms per gallon of the following strains of bacteria: bacillus subtilis, bacillus amuloliquifaciens, bacillus lichenformis, bacillus megatherium, pseudomonal fluorescens, commomonas terrigena and bacillius firmus. GENERAL ODOR CONTROL: To eliminate odor caused by vomit, spoiled food, decomposed animals, waste receptacles, etc., spray directly on malodor and allow bacterial action to work. The added fragrance will quickly neutralize any odor. CARPET DEODORIZING AND ORGANIC WASTE: Apply directly to malodor and allow bacterial action to work. The added fragrance will quickly neutralize any odor. GREASE TRAPS: Pour directly into sink or pipe closest to trap, typically at night. Flush down with a cup of lukewarm water. Use 4-5 oz. daily for traps less than 20 cu. ft. For larger traps, use 8-10 oz. daily. PORTA-TOILETS: Directly add 1 gallon and cover the solids with water. Repeat each time toilet is pumped. SEPTIC TANKS: Add 1 pint per 25 cu. ft. for initial treatment. Then use 8 oz. per week. Pour directly into toilet. If tank is clogged and odorous, add 1 gallon directly through tank manhole. DRAIN LINES AND DOWN PIPES: Use 4 oz. for each 2 inches of pipe size 2-4 times weekly. gallon per 50 gallons tank capacity. Maintain at 1 pint per week. Note: This product is most effective between a pH range of 5.5 – 8.5. Ideal temperature range for maximum performance is 54° – 113°F; effective up to 212°F. Avoid extreme changes in either temperature, pH and wide shifts in either parameters over a short period of time. Colder temperatures lower the effectiveness of the product and there is no bacteria activity under 40°F.